One of the reasons Matthew Sauk was hired by the Portland Thunder last October as its first head coach was because he possessed a long-term plan. That plan was to focus on young players -- many local guys included -- to help build a fan base while teaching the young guys how to play the arena style of football. He wanted the young nucleus of players to develop together as teammates, as a family and as brothers. It was a shaky start, but the plan would eventually begin to see fruition. Following five losses to start the season, including nail-biting losses to the Iowa Barnstormers and Los Angeles KISS, the team swept its two-game Florida road trip. The point totals were getting higher and the number of mistakes getting lower. The margin of victories were getting narrow. Sauk's guys were learning the game. In all, they would finish with just five wins on the season. Now a 5-13 record is nothing about which to brag, but going 5-8 in your last 13 games shows marked progress, especially for an expansion team. Sauk's plan was working. The team clearly improved by leaps and bounds over the course of the season. Even the casual fan noticed it; not to mention the Thunder faithful. The plan worked so well that the Thunder made the playoffs as the fourth seed. Yes, I know some will criticize a team for making the playoffs with a 5-13 regular season record -- don't blame Sauk nor the Thunder for that; blame the league and its alignment if you really have that much of a problem with it. The first round pitted the Thunder against the two-time defending champion Arizona Rattlers, a daunting task to say the least. The Rattlers were 15-3 on the season. The Thunder played with the power of lightning and, if not for an underthrown pass in the last 15 seconds of the game, might just have come away with the win and huge upset. The result was an entertaining, edge-of-your-seat thrill ride in which the Thunder ended on the short end of the scoreboard (52-48), but on the long end of a whole lot of league-wide respect. Some may claim that Arizona treated the game less seriously than usual, but those claims are wrong. The Thunder simply played one heck of a game. They left it all out on the field and deserved to hold their heads high. By the way, the Rattlers would end up clobbering the San Jose Sabercats in the conference final, 72-55, and would go on to demolish the Cleveland Gladiators in ArenaBowl XXVII, 72-32. Sauk's plan was working. Remember those local players mentioned above? Western Oregon's Bryce Peila (JLB) made the team all-arena second team (his teammate, DB Varmah Sonie, made the first team). Brandon Tett and Brandon Lockhart were stalwarts in their positions and while Darron Thomas had some troubles at QB, he found he was able to contribute in other ways, namely with an interception he ran back for a touchdown in the playoff game and 3 tackles on special teams in an earlier game (Thomas also led the team in rushing touchdowns). The local guys were making progress and were a whole lot of fun to watch. After some reflection, the coaches and players were recently beginning to get back into the business of preparing for their second season. Coach Sauk even put out a facebook message on Tuesday that he was looking forward to the start of free agency on September 25. Then the announcement came down on Tuesday afternoon that the Thunder had decided to abandon Sauk's plan and go with a "fresh face" to lead the team into its second season. Of course, what the team hadn't told anyone on Tuesday was that the "fresh face" was Mike Hohensee, a 20-year AFL coaching veteran whose teams have missed the playoffs the past four seasons. Coach Sauk was getting it done. The team was primed to make a jump in their second season. Sauk himself said on a couple occasions that he wanted to flip the 5-13 record to 13-5 in the second season. It is a lofty goal but I have no doubt the coach meant what he said. 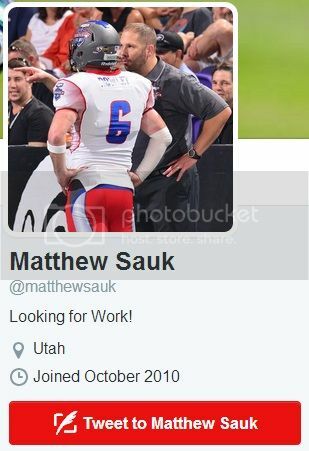 Sauk having a sense of humor with his new twitter status. Here is the problem: Without Sauk at the helm, the first season of progress seems like a waste. We have no idea what Hohensee will want to do in free agency or in the trade market. Will he keep Sauk's nucleus in tact or will he dismantle it in order to make the team completely his own? How in the world can this transition be a smooth one when the plan was in place and working? Could it be that when the Barnstormers fired Hohensee, the Thunder wanted to jump on the opportunity to hire a veteran which, of course, would mean the end of Sauk's tenure? Honestly, in the past couple hours of reading about him, I cannot tell that he is a better person to lead Sauk's team. Personally, I might turn out to like Hohensee and what he does with the team. Of that it is too soon to tell. The thing which will always stick in the back of my mind is why the Thunder did not keep Sauk around to continue to work on the plan which was working. I know he put a lot of heart and soul in to it and he wasn't done. This move was extremely premature. It will prove to be a step backward. I do not want that to be the case, but that's the impression my sports-loving mind is giving me. Yes, this move was extremely premature. Sauk brought enthusiasm to the team and to the fans. When I began to cover the Thunder for this forum, I got in touch with several people. Over the course of the season, all of them told me that despite the win totals, that they could see the improvement week to week by the Thunder. They told me they respected what Sauk was doing, that they respected the plan he had laid into place. Now, Sauk has been let go before that plan could come to fruition. The Portland Thunder organization has failed the team. It has failed the fans. It has failed the region. And all this because they pulled the trigger much, much too soon on Coach Sauk's tenure with the Thunder. nice work Angi. this comes at a puzzling time. i thought Sauk was doing a great job. he was building something. i'm really not in favor of this decision in the least. I am more curious about what this tweet from 40 minutes ago means. L.A. KISS might be my guess. get on this angle Angi! Hey VDN. Great to see you here! We need more knowledgeable people like you! It seems like Hohensee is a decent coach. On the other hand, replacing Sauk is not a good move. He had the team headed in the right direction and I think they could have won 10 or 11 games next season. I just wonder how the players will adjust to the coaching change. Had Hohensee not become available, Sauk would still be the coach. This is a trading up sort of thing and I've never been a fan of it in pro sports, unless you're looking at a guy who has been there and led the team to an unsuccessful tenure for a few years. I agree that Sauk has had things going in a good direction. Angi, I know you are on top of this and I know there are rumblings about Sauk finding another job. I would appreciate knowing if you find out and could pass that along. that first line is the key, Brian. they should have let Sauk work his plan for three years. We have a lot of guys coming back. We could add a couple of veterans and take the next step. This was dumb, dumb and dumb. A couple of weeks later and this is looking even more and more like a dumb move. The team really needs to get moving on its off-season acquisitions. Do you think he will try to get any of our players? i would like to see the team go after some bigger names in free agency, such as Russ Michna or Nathan Stanley from the Sabercats. they signed Erik Meyer, so at least one of those guys should be available. i believe Rowley is still under contract though. I've been meaning to thank you for that so thank you!